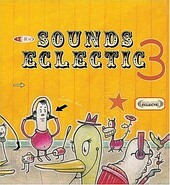 All songs on Sounds Eclectic 3 were recorded live on the hit radio show, "Morning Becomes Eclectic", the daily freeform music program hosted by Nic Harcourt at the public radio station 89.9 FM, KCRW in Santa Monica, California. Including songs by The Polyphonic Spree, The Flaming Lips, Damien Rice, Paul Weller, Radiohead, My Morning Jacket, Franz Ferdinand, Interpol, Iron and Wine, and Steve Earle, as well as others, "Morning Becomes Eclectic" has always been a breeding ground for what's up-and-coming and what is hot. As such, their compilations never disappoint, and Sounds Eclectic 3 offers up plenty of gems, including a sparse version of "Yoshimi Battles The Pink Robots, Pt. 1" by the Flaming Lips, Radiohead's "Go To Sleep" done acoustically, and a beautiful cover of The Flaming Lips' "Waitin' for a Superman" by Iron & Wine. The liner notes are very interesting, giving you insight into how each song was recorded. It seems Iron & Wine's "Waitin' for a Superman" was recorded after they were off the air, which makes this disc even more worthy of checking out. Every band/artist on here is a pro and, as such, gives a stellar performance of their worthy songs. Not one track disappoints. And, since sales of this compilation go to support KCRW, this is a must own. I'll give it a B+.